This week, for me, was about celebrating the last of summer before the hustle and bustle of back to school takes over. I’m not ready to see it go! So we made coconut cooling lotion, a pina colada smoothie and this paradise mango scrub to squeeze in one last trip to the beach (even if you’re at home) before fall arrives. And one of my favorite escapes on crazy days? The shower! 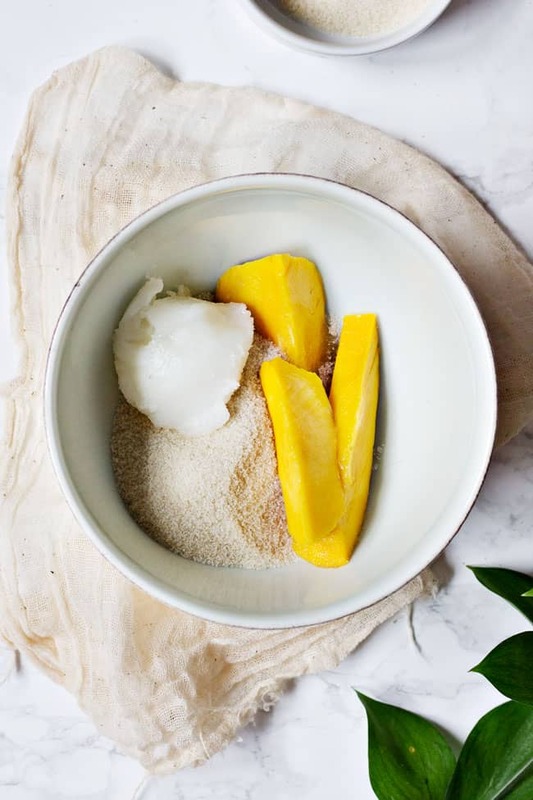 Whip up this easy, yummy scrub and make a tropical oasis in your bathroom (locking the door is recommended otherwise if you frequently have shower visitors like I do). 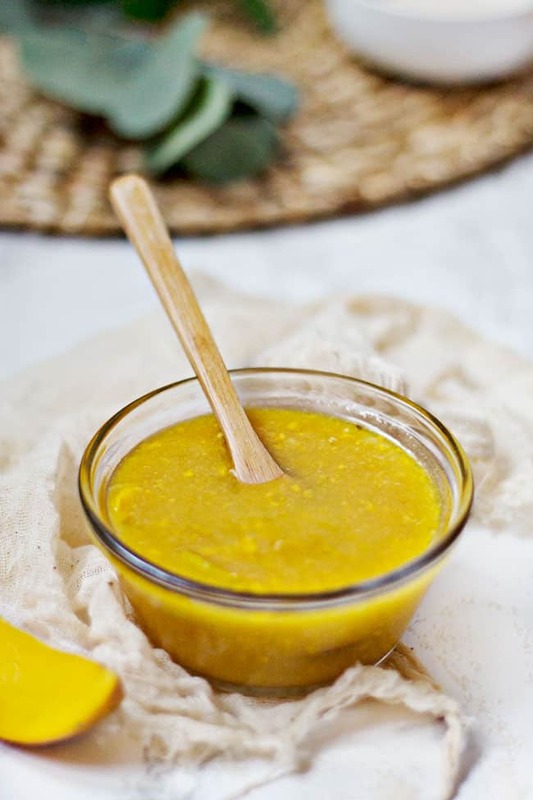 This tasty scrub combines exfoliation of raw sugar with the moisturizing benefits of coconut oil. If you’re making this scrub in the middle of summer your coconut oil is probably mushy or even liquid so it will be easy to stir. 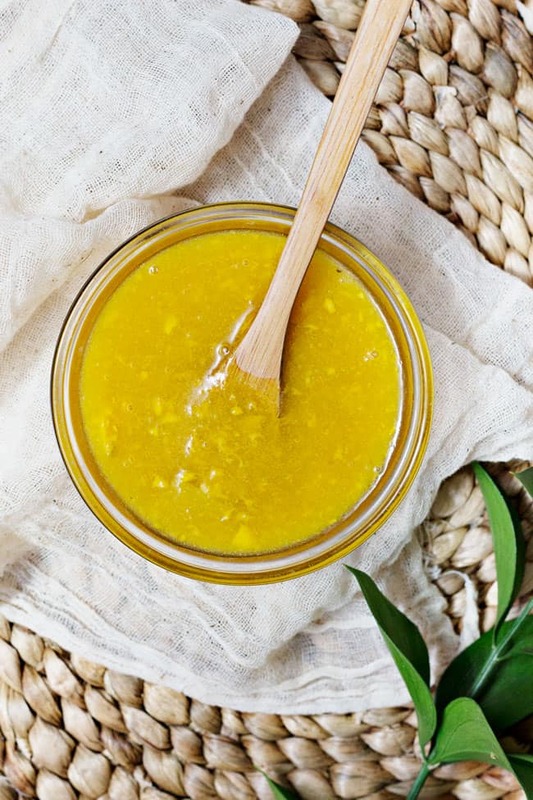 Chop up a 1/4 cup of raw mango and add 3-4 drops of orange essential oil . Mangoes are a rich source of Vitamin A, which helps slough off dead skin, and helps new, fresh cells beneath the skin appear. Then mash everything together. Add more sugar or oil until you get a thick, goopy consistency that’s not too runny. Hop in the shower and use your hands to apply. Scrubbing in a circular motion, start at your feet and work your way up. Combine sugar with coconut oil (heat in the microwave if it's solid). Add a 1/4 cup chopped raw mango and a 3-4 drops of orange essential oil. Add more sugar or oil until you get a thick, goopy consistency that's not too runny. Hop in the shower and use your hands to apply. Scrubbing in a circular motion, start at your feet and work your way up. Thanks for the post. How long would this last? Also, does it need to be refrigerated? Thank you! hi Stephanie, just loving this post. just want to one think. will it really work on our body or just west of time like the other body scrub? did you personally tried this? whats the result? Has anyone figured out how long this lasts? And you would find me sitting in the tub eating this straight from the bowl ! Why does this look so delicious and tempting !!! Yummy. Hi there! I also have the “how long can I use” question – how long does it last? Would it go bad? How long can I use this scrub :)? Is this at all sticky? I’ve been tempted to make sugar scrubs and the like, but it always worries me that it’ll leave me feeling sticky. I’m sooo trying this recipe. What is the shelf life for this? I have a mango tree and a surplus of mangos right now, but would like to gift this scrub for the holidays. This sounds delightful! I will have to try it. oh my god, this sounds perfect ! This looks amazing! I’m going to give it a try today. Just wondering how long do you think the product would last for in an air tight glass container? Perfect name bc this does really seem like it would both smell and feel like paradise!